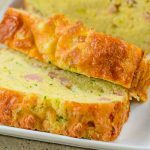 This easy, moist Bacon and Cheese Keto Zucchini Bread recipe is perfect for brunch. It's best served warm topped with butter. In a large bowl add the almond flour, coconut flour, salt, pepper, baking powder and xanthan gum. Mix well. Add the eggs and melted butter and mix well. Fold through ¾ of the cheddar, along with the zucchini and bacon. Spoon into your greased 9in ceramic loaf dish (if using a meat dish, line with parchment paper) and bake for 35 minutes, remove from the oven and top with the remaining cheese. Bake for another 10-15 minutes, until the cheese has browned and a skewer comes out clean. Slice into 12 slices and enjoy warm.